Where did the tooth fairy come from? Believed to originate in the United States, the legend states that when a young child loses a baby tooth they should put it under their pillow. That way, while they are sleeping, the tooth fairy will visit and exchange their tooth for a gift. But history is just one of the fun parts of the tooth fairy tradition. The idea that children around the world receive a gift for their bravery, is practiced in many cultures. Perceived as a sign of growth, children should celebrate as they move into older years and grow their adult teeth. 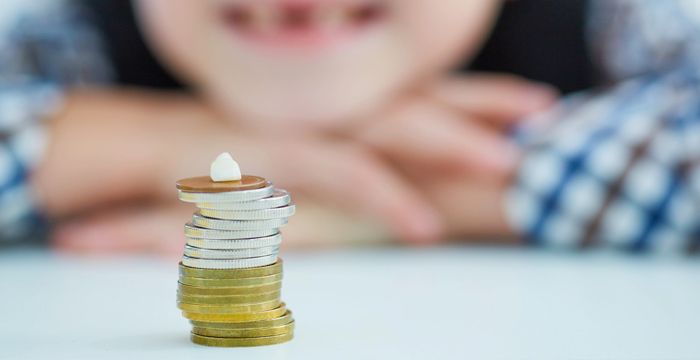 Believing in the tooth fairy can be fun; it can even help with keeping oral hygiene an entertaining and rewarding experience for kids. The myth is especially helpful for children who fear losing their baby teeth. Many youngsters find comfort believing in the fairy tale, which helps them overcome feelings of apprehension. Use this opportunity to improve their dental hygiene. Maybe the tooth fairy leaves behind a new toothbrush or a new brushing chart. After all, they may listen to the tooth fairy’s advice. Write decorative, fun notes from the tooth fairy, giving your tooth fairy a delightful and amusing personality. Leave a trail where the tooth fairy came from. Maybe use glitter or confetti that leads to a door or window. Have a story in case the tooth fairy forgets or gets caught. It can happen, so be ready to quickly slip a coin in a hiding spot and ask them to check their pillow again. So if you choose to carry on this fairy tale and play the tooth fairy, there is nothing wrong with inviting this tradition in your home. Have fun, be creative and as always reinforce good oral health practices.